I’ve been really enjoying this game since its Android beta. My ranking normally hovers around the 3000 mark and while I have a couple of 12-win event runs under my belt, I don’t claim to be an expert player – particularly in terms of deck optimisation. 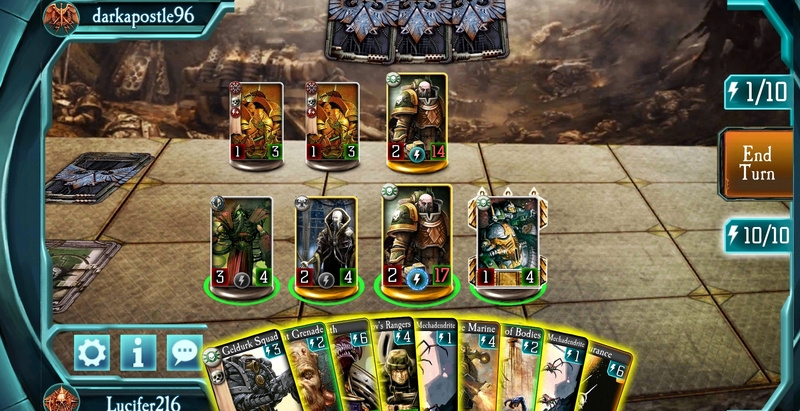 This guide is therefore aimed at people who are perhaps new to the game or turn-based collectible card games in general. After much frenzied typing, I've finally finished creating a new villian for the Antona Australis Sector: Germax Sahawat. Here's a list of some of the most effective painting recipes I've come across in my travels. Please note that I'm not the original author in most cases - where I know the creator their name is listed. I've kept to the original paint names as the new range isn't an exact match. I bought The First Heretic (TFH) at Games Day and read it on the coach back. It's a strong performance and I'd rate it as one of the best of the Horus Heresy books to date. In places I would rate it as equal to or above Horus Rising. In his blog, Mr ABD makes a reference to the difficulty of topping Dan Abnett's introduction of Horus. In my opinion, the confrontation between Lorgar, Gulliman and the Emperor is easily on a par, possibly exceeding it for emotional impact. Occasionally, there are times when I am forced to take a long hard look at myself and my relationship with our glorious hobby. The latest of these came, after shelling out a hefty sum on a new Skaven army. This was sparked by the realisation that if I was to get hold of the new Warhammer rules, I’d rather get a bunch of nice minatures rather than a rulebook that could be used as a bludgeoning weapon and which would be made obsolete in about four years time. I then had sudden flashbacks to my poor neglected Imperial Guard army, which has still yet to see the light of day. Today's lesson is on the art of getting Gamesworkshop models on the cheap. 2) The above, but in the form of private individuals or games groups, who only sell to the general public so that they can continue to buy models from GW at wholesale prices. Rule no.1 - When performing a mindless task, ask yourself the following question: Are there gaps in which I can slot painting into? If there are, DOOO ITTTTT! Even computer games can offer potential for this (loading times, etc). Rule no.2 - Eye contact is overrated. Conversations with other people can be accomplished while painting. Warning: This is not well understood or appreciated by WAGS. ATTEMPT IT AT YOUR OWN PERIL.